Have you ever read the side of a salad dressing bottle? Be in a patient mood when you do. Hard-to-pronounce words followed by a list of chemicals. My mantra is that, if I can’t pronounce it, I shouldn’t be eating it. Ingredients often look scary to me… preservatives like potassium sorbate, red or yellow coloring, thickeners like xanthan gum and moderately evil flavor enhancers like monosodium glutamate. Not to forget sugar. Plenty of sugar in them, there bottles. When I “went healthy” many years ago, I dropped the bottled stuff and started making my own. Very surprisingly easy to do, once you get the hang of it and learn what tastes good to you. And the biggest accomplishment is knowing how to dress a salad without measuring. Bonus! This four-ingredient Dijon vinaigrette recipe is one I created and have enjoyed at least a hundred times. It’s my tried-and-true, go-to salad dressing. Make a double or a triple batch to keep on hand in the fridge… it lasts about a week if it’s sealed in a container. It’s also quite tasty as a marinade for grilled chicken. Pour it on about 20-30 minutes before you’re ready to cook for best results. Makes about 1/3 cup and doubles/triples easily. For something different, add minced fresh herbs like basil, parsley or thyme. In a small bowl, or even in the bottom of your salad bowl, combine garlic, mustard and vinegar. Stir well with a whisk. Add olive oil slowly, whisking constantly, until emulsified and thick. Season to taste with salt and pepper. 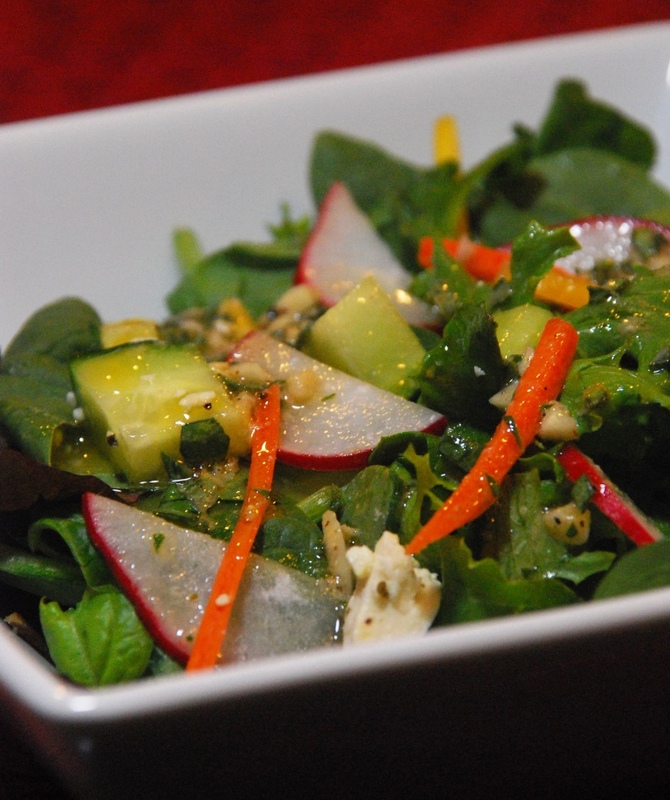 Toss into salad greens and fixings, adding enough salad dressing to your taste. Store remaining dressing in a sealed container in the fridge for up to a week. Okay, you’ve convinced me to start making my own salad dressing too. This looks too good not to try! And also not overly complicated to make, which is nice.